Thanks Cookie and Brandi for the pics. They are wonderful. To see sweet Caylee hasn't been forgotten. And sad that another child has be taken from us because of her mother. Both Cookie and Tupelohoney when I went to where Caylee was found the same feelings over came me. Going by the Anthony's home all I felt was sadness with an empty feeling. It's all so sad. Jeff Ashton writes in Tuesday's "Imperfect Justice: Prosecuting Casey Anthony" that he would have been happier if the prosecution team had left the death penalty off the table. He also confirmed that toward the end of the trial, Anthony's attorneys tried to persuade the 25-year-old to accept a plea deal but she refused to listen. "Personally, I think I would have been happier if the death penalty had not been reintroduced into the case, even though I think on some level I think Casey may have deserved it," Ashton said in the 324-page book. "Simply put, I just didn't think the jury would go there." As it turns out, Anthony refusal to accept a deal paid off. Jurors in July acquitted her in the killing of her daughter, Caylee, and she was released from prison, though she is in hiding somewhere in Florida, serving probation for an unrelated check fraud case. Ashton's book is the first account written by one of the key players in the trial that captured the attention of the nation last summer. The 54-year-old career prosecutor retired as planned after the trial, following 30 years of trying cases. The film and television rights for the book have already been bought by Fox Television Studios, studio spokeswoman Leslie Oren said. The project is being developed for the Lifetime cable network. Ashton also displays an unflattering view of the jurors. He wrote they seemed to give a lot of thought and discussion to which movies they wanted to watch or which restaurants to go to while they were sequestered. Yet no juror asked a single question about the evidence during deliberation. "From the moment our jury had been fielded ... we'd had concerns over their apparent absence of strong opinions as well as over the amount of effort they seemed willing to expend on this," Ashton writes. "In retrospect, I think those concerns were justified." Three jurors gave television interviews immediately after the verdict, but they have since refused to talk to reporters about the case. Wednesday morning, the retired Orange County prosecutor sat down for an interview via satellite with Adam Longo. You can watch the entire eight-minute interview Wednesday night at 6 p.m. exclusively on News 13. Talk LIVE with us starting at 3 p.m. on the case against Casey Anthony. Green Eyes... glad that u had the same feelings..definitely was there..
Can not wait to start reading his book..probably on the plane home tomorrow. I have to wait until 4:00 for Dr. Phil....drat. And yes, it's nice to know that others have had the same feeling we had at Caylee's site. What a strong presence Caylee has in her afterlife. Imagine what could have been, if only she had lived. Tupes..you gotta watch it at 4..it is really good. Watching now. Jeff said he was laughing during Baez's closing argument for two reasons.....what Baez's argument was (trying to pin it on George) and the fact that his voice went up a few octaves while delivering his speech. We all know that Baez is laughable.....Jeff just couldn't help himself at that moment. 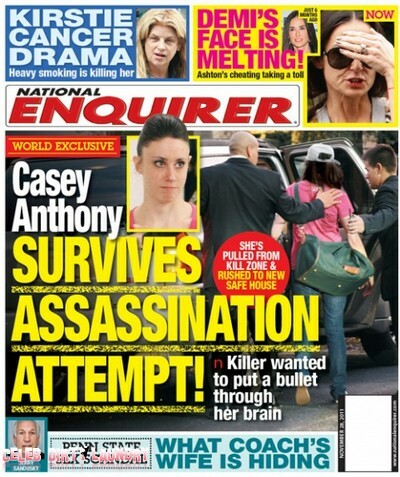 I read the article that another monkey showed of the National Enquirer...not sure if it was true or not. Who is paying the salaries of her so called body guards? I saw that posted, and went right on by. Talk about laughable!! I'll go read it now, but from the headline......I see the Anthony camp hard at work....what great timing too, just as the truth from Jeff's book comes out. They are so predictable. Tupes..didn't think of that when I saw the article but now that u say that, it makes perfect sense..
Also, someone on here asked if Lee had gotten married...anybody know? I don't know......and I really don't care. If they have children, I will pray for those little ones. What a crock of CHIT! She was pulled out of the line of fire in the nick of time???? She's not getting counseling but taking language courses so she can leave the country. GOOD Hope she is on the first plane when her probation ends and we never have to hear from her again. But she better study every language possible!! Ashton to defend an attempted murder suspect. The big role reversal tonight at 6 p.m.
OMG! We are supposed to let Casey be so she can be safe. HOW ABOUT US??? No one is safe with her loose in our society. I truly wonder how long it will be before she causes harm to another individual.....by any of her actions. Page created in 2.138 seconds with 21 queries.